Vote life, family, and community values! 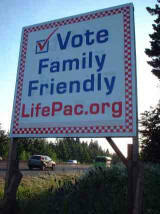 LifePac surveys SW Washington candidates at all levels of government to determine pro-life, family and community positions. LifePac believes in the sanctity of all human life from conception to natural death. Striving to be authentically pro-life, we promote a consistent ethic of life regarding abortion, poverty, euthanasia, capital punishment, war, racism, nuclear arms and exploitation, but hold that the toll from abortion today far exceeds the loss from other threats to life. "The concerns for non-violence, sustainable development, justice and peace, and care for our environment are of vital importance for humanity. They cannot, however, be understood apart from a profound reflection upon the innate dignity of every human life from conception to natural death: a dignity conferred by God Himself and thus inviolable." We are a Washington State registered and incorporated political action committee serving Southwest Washington for the research of pro-life and pro-family candidates and issues. LifePac's objective is to identify and promote local pro-life and pro-family candidates to serve at the national, state and local levels of government. Determination of a candidate's pro-life and pro-family position is based on one or more of the following criteria: voting records, public statements, questionnaire responses and interviews.